Mechanical-biological waste treatment (MBT) is an efficient and comparatively cheap way to recycle components of the residual waste and to reduce organic input into landfill. In Germany 42 MBT plants with an annual treatment capacity of more than 5,100,000 t per year are in operation. In Austria and Italy MBT is also a wide spread technique and it is going to become a very important waste management option in many other countries. In a time of strongly increasing demand for material resources, extraction of recyclable materials from waste is becoming more and more important. Waste-to-Resources MBT focuses on MBT and additionally on automatic waste sorting technology as the bridge between waste management and recycling industry. 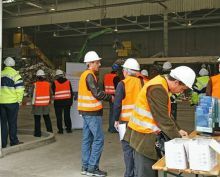 Having participants from about 40 countries each, the previous Waste-to-Resources conferences underlined its position as world’s most recognised conference on MBT & MRF (material recovery facilities). On three days experts from nearly 20 countries will present their practical experiences and new developments. Each presentation can be heard in English, French, German and Spanish language due to simultaneous translation. On the 14th of June, a technical tour to MBT Pohlsche Heide and other facilities is offered. On the exhibition taking place parallel to the conference, prominent companies from the area of waste treatment will present themselves.